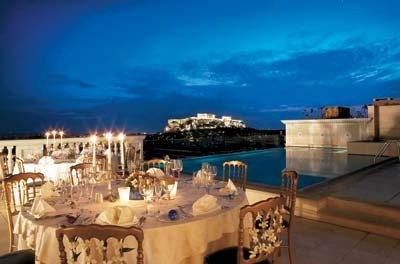 Ideally located on Constitution Square, the Classical King George Palace is one of the most famous landmarks in Athens. Since 1936, this prestigious hotel has been home to kings, princes, presidents and Athenians alike. 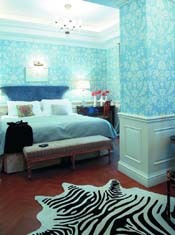 In the 50s, 60s and 70s, it was the favourite hotel of international celebrities, magnates, world leaders and movie stars. Situated in Athens’ golden quarter, the Classical King George Palace is a proud member of the Leading Hotels of the World. Resting in the heart of the business and shopping district, it enjoys a privileged position between the Parliament and Voucourestiou Street, the Athenian Sloane Street known for its nightlife, business and luxury. 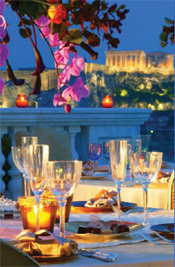 The best hotel in Greece ranked among the 100 Top European Hotels in the Condé Nast Traveler 2006 and 2007 Readers' Choice Awards, also honored by the magazine in its 2005 Hot List and its 2007 and 2008 Gold Lists, as well as ranked among the 500 worlds best hotels 2009 by Travel + Leisure Magazine. Each and every guest room and suite is individually designed and decorated with a rich residential feeling, complemented by the latest technology interfacing with antique furniture and Murano chandeliers for guests who seek exclusive accommodation to match their exacting standards. The guestrooms and suites feature: individual thermostat control, complimentary toiletries, down pillows, duvets, hair dryer, in-room electronic safe, hypo-allergenic foam pillows, mini bar, plush cotton towels and luxury bathrobes, twice-daily housekeeping service, TV set with satellite channels and Pay TV. 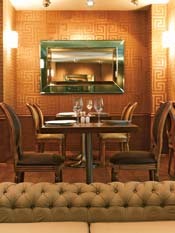 Located on the 7th floor overlooking the Acropolis, the Tudor Hall is Athens’ most acclaimed gourmet restaurant, serving a Greco-French menu. On the ground floor, the T Palace all day lounge bar and restaurant is the ideal place for a rendezvous, an after-work drink and dinner parties. A royal delight, the Palace Spa offers an array of rejuvenating treatments by Decleor combining the best of ancient and modern techniques. 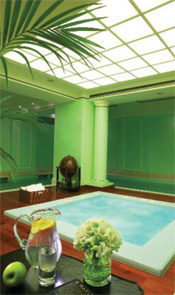 Take a dive in the pool, relax in the Jacuzzi or enjoy new treatments at the Little Luxury Day Spa. Classical King George Palace is also a wonderfully unexpected setting for meetings and events of all sizes and sorts. From the glamorous Grand Ballroom to the one and only Royal Penthouse suite, the hotel is well equipped to accommodate anything from an off-site concept meeting of your company to the exclusively unique wedding you’ve always imagined.